Defragmentation is a process which reduces the amount of fragmentation for maintenance of file systems by organizing the content of hard disk in which fragments of a file are stored. Fragments are the parts of data which gets stored non sequentially due to inability of system to lay out related data contiguously. Auslogics Disk Defrag is a defragmentation utility with advanced features which will help you to reduce the time taken by your system to open a file and it optimizes your PC too for the better speed. It is a freeware with a simple and user friendly interface which makes it quite easy to use. It is quite easy to install this program except you need to take care of third party software which can change the browser settings that it offers during the installation. Some rare issues under Windows Vista are fixed. Various bug fixes are done. Optimized Installer for Windows 8 and added full support for it. Some errors in language files are corrected. Auslogics Disk Defrag not only organizes fragmented files but also optimizes the storage drive in order to bring better performance. It consists of powerful optimization algorithms which defragments the free space, clear the MFT Reserved Zone from regular files(MFT Fragmentation occurs when MFT reserved zone is used for storing regular files, this happens when rest of the disk space gets low) and moves files of the sysytem to the fastest part of the disk. Defragmentation with this utility is a fast process, it only takes a few minutes. It has a powerful engine to defragment huge space which leads to increase in computer performance and stability. When a defragmentation tool organizes the fragmented data, it leaves fragmented space free. This free space is called ‘holes’ which remains spread all over the disk. These holes get filled with newly created file. Auslogics Disk Defrag merges free space into a large contiguous block during the optimization process to prevent file fragmentation. It defragments system files smartly and moves them to the fastest part of the disk which improves the access speed of system files which results into increased system stability and speed. If you don’t want to defragment the whole disk, you can just select the file or folder name from advanced options and defragment a single file or folder which is frequently used. 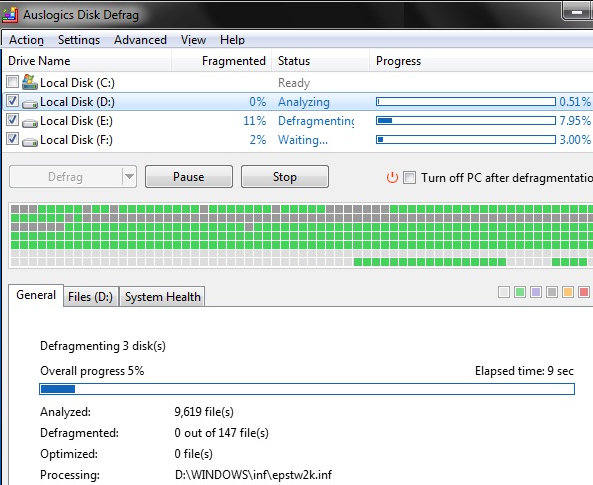 Sometimes, it doesn’t make sense to defragment whole disk as it takes more time. You can just defragment the file or folder of you choice to increase the speed of an application and save time. Auto defragmentation is an advanced feature, when selected, it automatically defrags your system in real time when your system is idle. It quitely defragments your hard drives in the background and you may not even notice it as it uses very few system resources and is compact in nature. 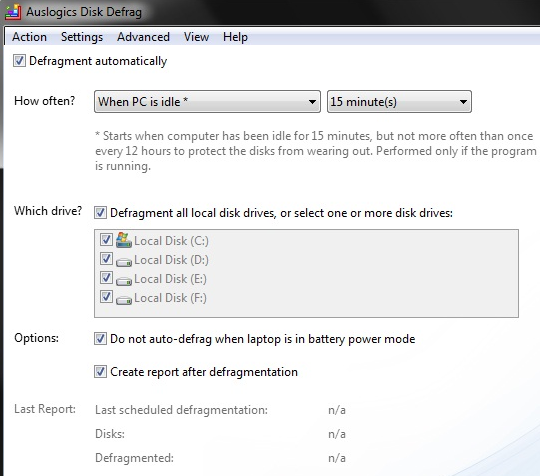 Once you set your system to auto defrag, you may never find the problem of fragmentation in your drives. Auslogics disk defrag can be customized manually like you can easily integrate it into Windows Explorer context menu and make it sit anywhere in the system tray. You can set it on automatic mode and forget about fragmentation. You can even select to shut down your computer in the program after defragmentation is complete. You can also apply several map color themes to change the look of disk defrag. You can also choose to customize from algorithms. 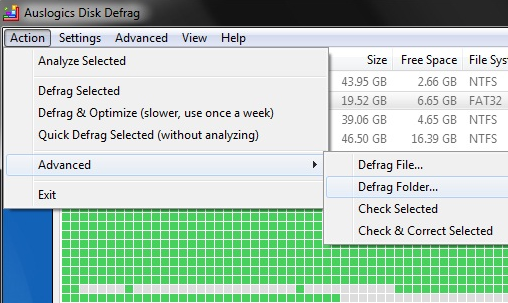 After performing analysis, disk defrag will make a list of all fragmented files and show you. 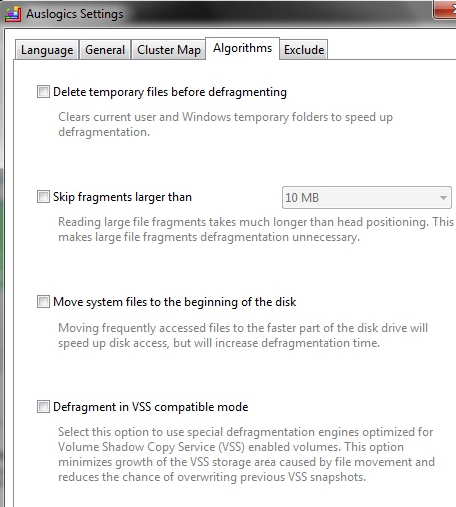 You can select any of the fragmented files to defragment and ignore. 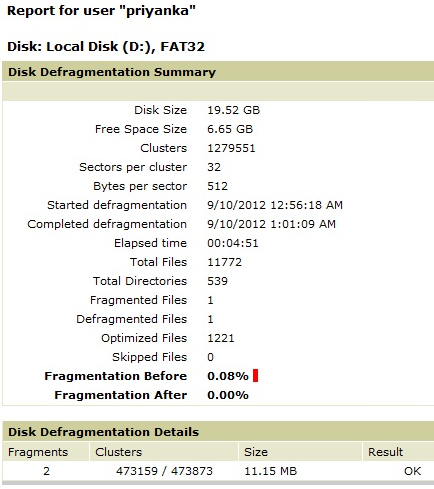 It also gives you the detailed summary of defragmented disk or file like disk space, free space, clusters etc.